New website for the City of Cleveland Heights enhances communication through advanced online services, unique design themes, and detailed content navigation. Website was built in partnership with Vision Internet – The Government Website Experts™. We have worked hard to build a versatile and engaging website to better inform and serve our community. The City of Cleveland Heights recently launched a new city website featuring interactive online services and an abundance of informative content. New features such as dynamic calendar and news feeds, an advanced eNotification System, a document central, and searchable business directory have made information more accessible than ever before. To best organize site content, the City took a more intuitive approach to site navigation. A network of dropdown menus, quick links, left-side interior navigation, and a powerful tool bar effortlessly guide users through the site. Because of all they have to offer, sub-sites were created for the Police Department, Parks and Recreation and for Cain Park, Cleveland Heights’ summer performing arts complex. Separate navigation menus were used for these departments to better accommodate their specialized services. In addition, interior design themes were created for the Fire and Economic Development Departments. “The detailed design themes provide added distinction between these unique departments,” continued Fox. The website was created in partnership with Vision Internet and is managed using its government content management system – the Vision CMS™. Over 400 local governments across the US and Canada are managed using this versatile government CMS. The user-friendly interface makes updating the website simple for City employees regardless of their technical background. 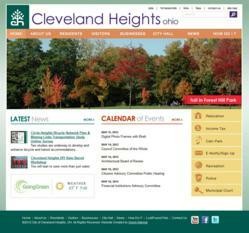 For more details about the Cleveland Heights website, please click here. Vision Internet is the leader in government website development. For 16 plus years Vision Internet has been creating industry-defining websites built on leading technology including the government content management system, the Vision CMS™. Widely recognized as the government website experts, the company has earned hundreds of prestigious industry awards for its unique websites.